From the tiniest teacup poodle to the most massive Great Dane, dogs' digestive systems are pure wolf. Fido's ancestors enjoyed a diet that was 45 to 50 percent protein, 40 to 50 percent fat, and less than 10 percent carbohydrates. Walk down the pet food aisle, however, and you'll find that typical commercial kibble is made mainly of starchy ingredients like peas, potatoes, corn, wheat, rice, and oats—nothing a prehistoric pup would dream of eating. This "healthy" mix is proving anything but: About 85 percent of dogs eat commercial dog food, and at least half of them are overweight or obese, with cancer killing 42 percent of all dogs and half of dogs over the age of 10. So how do you feed a wolf disguised as a pug? Paleo Dog - by Jean Hofve, DVM, and Celeste Yarnall, PhD - guides readers through an assessment of their dogs' diets and helps them find the right balance of healthy ingredients. In addition to recipes and nutrition info, the book offers advice on what treats are safe, training tips, the benefits of exercise, massage, and other alternative therapies, and how to ensure that dogs receive the love and attention they need. Paleo Dog is the ultimate manual for any pet owner who wants to give her pet the longest and best quality of life. JEAN HOFVE, DVM, is a holistic veterinarian with over 20 years' experience in conventional and alternative veterinary medicine and coauthor of The Complete Guide to Holistic Cat Care. CELESTE YARNALL, PhD, is the author of Natural Dog Care and coauthor of The Complete Guide to Holistic Cat Care. 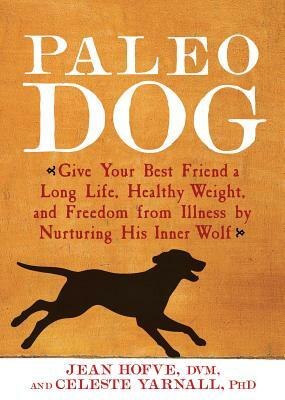 “PALEO DOG is the bible for every dog lover. A must-read.” —Tony O'Donnell, Ph.D.